Mon., Jan. 15, 2018, 9:53 a.m.
PORTLAND, Ore. – Oregon lawmakers are considering a major change in how the state will go about reducing its contributions to climate change. Right now, there’s nothing to stop a lot of Oregon businesses from pumping carbon dioxide into the atmosphere. The Clean Energy Jobs Bill introduced last week would launch a cap and trade system that would limit some of those emissions and charge businesses for the right to pollute. The system would be similar to existing programs in California and some Canadian provinces. How would Oregon’s cap and trade system work? The state would set a cap on total greenhouse emissions, and about 100 companies in the state’s largest industries would be required to buy pollution permits to cover their emissions. Over time, the cap on emissions will come down and there will be fewer pollution permits available. So companies will have to reduce their emissions, spend more on permits or buy credits to offset their emissions. How is cap and trade different from just setting laws that limit emissions? This system would create a new marketplace for pollution credits that companies can buy and sell. It would be designed to link up with existing markets in California and Canadian provinces, so a company in Oregon could buy pollution credits from a business in California. It also creates a market for offset projects, so a forest landowner in Oregon could sell the carbon sequestration credits from not cutting down trees. Buying an offset credit may be a cheaper option for companies that need to reduce their emissions or buy a pollution permit. Creators of the bill call it a “cap and invest” program because the state could make an estimated $700 million a year from selling pollution permits. That money would then be invested in project that expand public transit, solar power, electric vehicles and home energy efficiency upgrades that will help reduce the state’s overall greenhouse gas emissions. How much would this kind of system cut the state’s greenhouse gas emissions? The bill mandates reductions down to 80 percent of 1990 emission levels by 2050. Supporters say that’s the only way the state is ever going to meet its targets for reducing carbon emissions. Right now, the state is way behind on the climate goals it set in 2007. Environmental groups point to California’s cap and trade program and its recent renewal as proof that this kind of system can reduce emissions and generate revenue without hurting the economy. What do opponents say about this idea? A lot of industries are opposed to a cap and trade system in Oregon because they say it will inevitably raise prices for all kinds of energy, which affects businesses as well as the cost of living for everyday people. Oregon Business & Industry, the Oregon Farm Bureau and Northwest Food Processors Association, which together represent thousands of businesses across the state, have all spoken out against the Clean Energy Jobs Bill. The bill is designed to address some of these concerns by setting revenue aside to help low-income families, displaced workers and rural areas adapt to the new policy and the effects of climate change. With a short legislative session, what are the chances this bill is going to pass this year? There’s a chance the bill will pass this session but it will depend on what else lawmakers have to tackle. If Measure 101, the so-called health care “provider tax,” doesn’t pass, lawmakers will likely be too busy with health care issues to address cap and trade. After months of work group sessions, though, lawmakers now have a detailed proposal to work with. The program isn’t scheduled to launch until 2021, so the Legislature could also pick it back up next year. Oregon Gov. 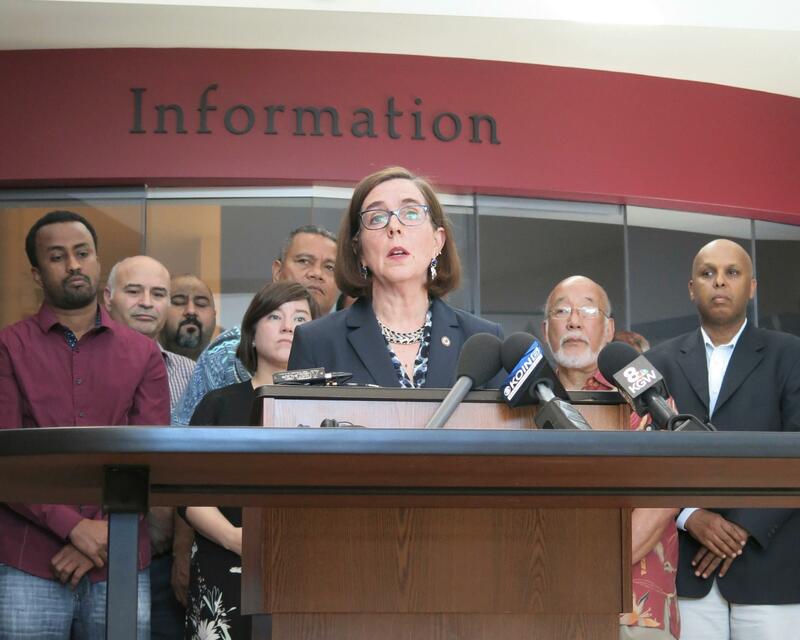 Kate Brown issued a statement outlining her requirements for signing any bill that creates a cap and trade system for the state. They include protecting people from utility rate hikes as the state transitions away from coal-fired power and investing revenues to help rural and under-served communities make the shift to cleaner energy sources. Published: Jan. 15, 2018, 9:53 a.m.